Ever wondered how much a sandwich would cost you in Westeros? Or how much a pint would set you back in the leaky cauldron? Well now you can find out with our handy infographic! 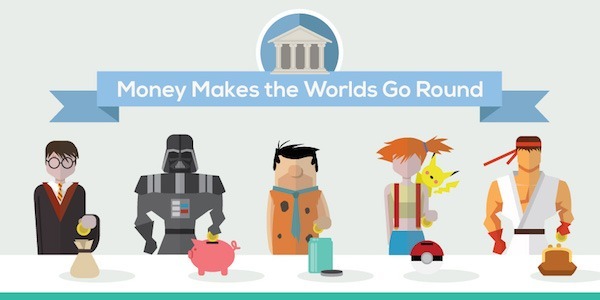 We have looked at some of the most interesting and famous examples of fictitious currencies in films, tv, games and literature. Not just to find out some interesting facts about them but to compare the currency with that of the pound and the dollar. We did this by taking prices of items in the fictional world and comparing it with the real world equivalent price, which then allowed us to come up with the exchange rate. There is a long history of fictional currencies, with writers finding different and imaginative ways to create a currency in their created world, and it isn’t necessarily always monetary based. For instance, in the world of George R. R. Martin’s ‘A Song of Ice and Fire’ there are different measures of wealth, in some cities it is based on how many slaves you own rather than coins, in others it is an honour system. In games there are all sorts of weird and wonderful currencies. Anyone who has played Fallout knows the satisfaction of drinking a Nuka-Cola and collecting a bottle cap, which is one of the main currencies in the game. Who wouldn’t want a drink that turns into money, even if it does give you a little radiation with it! So next time you are down at your local supermarket why not confuse the staff by asking for price confirmation of the gammon in Gils, the salmon in Solari and the clams in… well, Clams. We hope you enjoy our infographic and find it useful next time you’re shopping in the fictional world.